When I received a package with review samples from MIG Productions I was very surprised by the weight of it. Of course I knew that resin sets are much heavier than plastic kits, but the weight of the box was surprising anyway. Only when I opened the box I discovered the cause of this phenomenon. In the box, among other samples, was the "Doric Greek Temple" set and this is really one heavy product. So beware if you plan to mail order it - because of the weight the shipping cost may be much more than you are used to pay! The set comes in the plain white cardboard box, which is about the size of typical smaller1/35 kit, but in the resin aftermarket sets world it means a really large box! The approximate dimensions of the box are (W x L x H) 9.25" x 12.75" x 2" or 23.5cm x 32.5cm x 5.5cm and the weight is hefty 1.1 kg (over 2.4 lb. On the box lid is a label with photos of assembled and painted set. 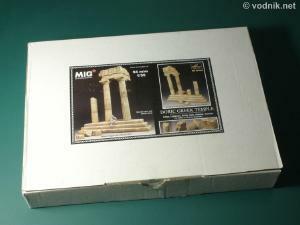 The scale information on the box suggests that the product is suitable for both 1/35 and 54mm (1/32) scale dioramas. 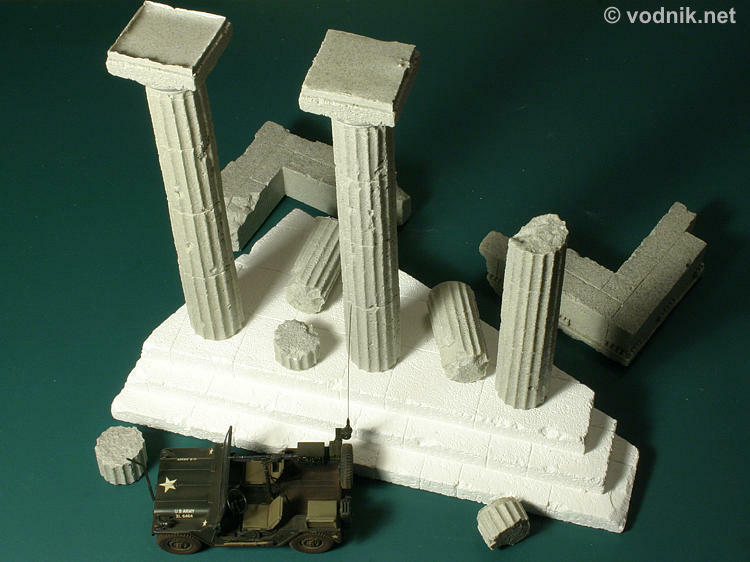 Some suggested geographical locations for dioramas in which the set can be used are listed and include: Libya, Lebanon, Sicily, Italy, Greece and Tunisia. Click on picture to enlarge it. Close-up of some resin parts. 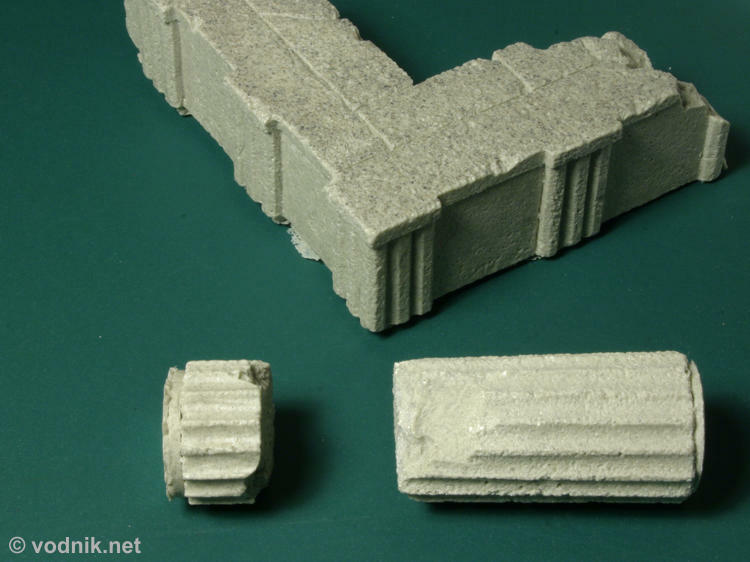 Inside the box we get one large triangular base made of plaster (9.5" x 5.75" or 24cm x 15cm), two complete columns (6.5" / 16.5cm high excluding top plates), six pieces of damaged columns and a two piece section of the roof. Except for the base all other parts are cast in gray "stoned resin" - it looks a bit like a resin mixed with sand. No instructions are provided, but they're not needed. All one needs to do to assemble the set is to saw off the resin casting blocks and glue parts together. 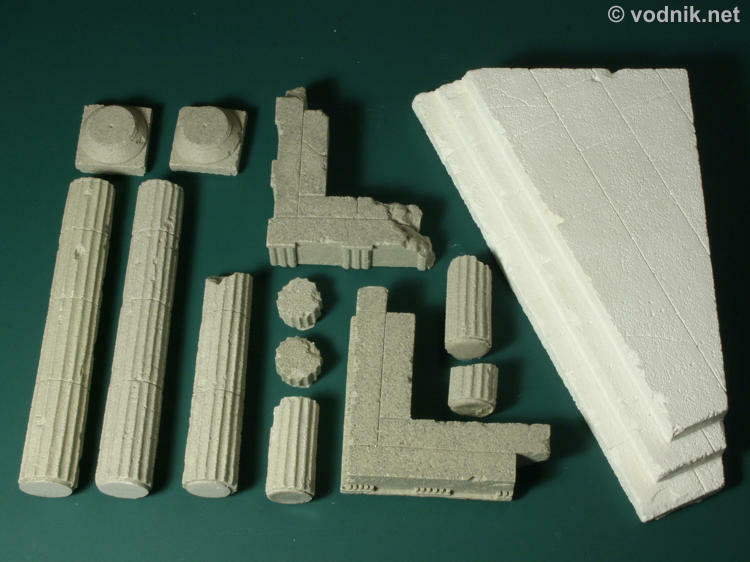 It is up to the modeler to decide how to put parts together to match the diorama design. I was afraid that "stoned resin" may be difficult to cut and saw, but it is actually as easy to work with as any standard resin. 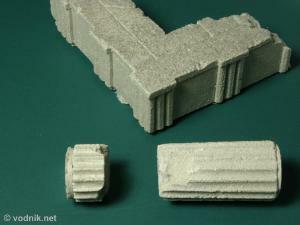 The only problem may be finding a good way to join heavy resin columns to plaster base. I assume that resin parts should be easy to cement with CA or epoxy glue, but these may not work well with plaster. Particularly if one plans to use the quite heavy roof section on top of the column it becomes essential to make sure that the column is well secured to the base. I suggest drilling a hole in the base and in the column bottom and using some kind of pin to hold parts together. I have not noticed any air bubbles or other blemishes on parts, but even if there are any, the nature of the set makes them unimportant. After all parts are damaged by design. I put the 1/35 scale Ford M151A1 model on this photo to better show the size of MIG set parts. This is very interesting product, although with somewhat limited appeal. Doric temple is not a universal background and many modelers may find it difficult to imagine scenario in which such structure would fit. But if you have an idea for such diorama, the MIG set is what you need. It is easy to use and well cast. Recommended!